I had just spent two days strolling with my friend around Lisbon and I had exactly one day left in the Portuguese capital. My friend unfortunately couldn’t join me that final day, as she had to take the plane back to the Netherlands because of work. An hour after we had said our goodbyes (it was the middle of the night) she texted me from the airport saying: ‘have fun today! It’s raining though…’ Oh great, I thought, just when I had planned to take the train from Lisbon to Sintra. But, I decided I was going there, rain or no rain. Miraculously it was dry when I set out for breakfast. 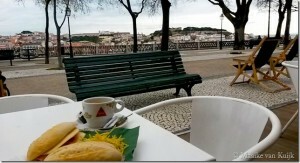 I took a seat at a terrace with stunning views over Lisbon. Shortly after I made my way to Lisbon’s Rossio station and bought my train tickets. These were extremely cheap and easy to get. Soon enough I found myself on the 10am train Sintra-bounded. On my way I passed numerous of grey flats and apartment buildings and I was surprised how far the suburbs of Lisbon actually stretch. The weather had decided to match with my view of the outskirts. Thick drops of rain dripped down on the carriage’s windows, and grey clouds kept on gathering and formed into one big mass of water vapor. After the 45min train ride I arrived in Estefânia. 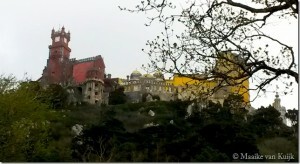 You have to realize that when people talk about Sintra, they refer to Sintra-Cascais National Park. This area covers 145km² (56 mi²), and sure enough this smart girl didn’t do her homework and had no idea about the size. I just expected a town with several beautiful buildings that I could visit on foot. How foolish it was of me to think that became clear very quickly. I entered a souvenir shop to ask for directions. ‘Girl, you can’t walk everything in one day! You should take a taxi or get on the hop-on-hop-off bus,’ was what the saleswoman told me. Oops. That was not really the answer I had anticipated. Nevertheless, I had learned that as a traveler you have to be adjustable to unexpected situations. Paying for a taxi obviously didn’t fit in my student budget. That is why I bought a ticket for the hop-on-hop-off bus. It was still drizzling when I came out of the restaurant where I had lunch. I found it hard to take pictures while at the same time making sure that I wouldn’t stick someone’s eye out with my umbrella. 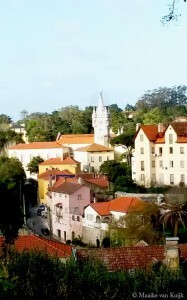 Sintra-vila is a nice little town that houses Palácio National, as well as some hotels, shops and restaurants. The Moorish palace that’s set in the heart of town has two very distinctive cone-shaped towers and a very rich history. However, as I watched the sightseeing bus pulling up at the bus stop, I decided to continue my trip. The road curved sharply, and I found myself in a beautiful green and hilly area. Totally different from the grey suburbs I had seen on my way on the train. 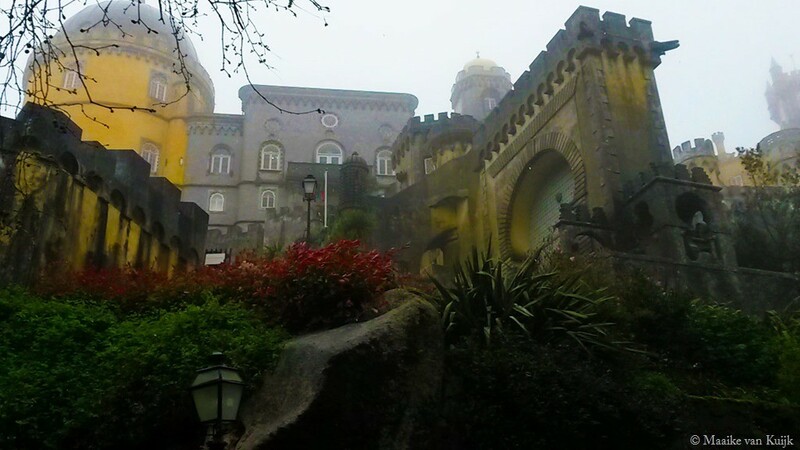 We arrived at my second stop, which was Palácio de Pena. I knew I had to visit this place. The pictures of the yellow-and pink Moorish palace I had seen appeared to come straight from the One Thousand and One Nights story. At the ticket booth, the (not so friendly) woman told me that I had to decide how many attractions in the park I wanted to visit. This would determine the price of the ticket. Entrance to Palácio de Pena and Parque de Monserrate combined cost €13,50, so that’s what I decided to take. I was a bit disappointed that I wasn’t able to visit the other palaces and attractions on my way. However, I also knew that it just wouldn’t work out time-wise. As it turned out, it was still grey and rainy. The palace was covered in mist, giving it that extra mysterious look. A small train took us up the hill to the palace, and I walked through mock Manueline gateways, passing domes and castle towers in order to enter the inside of the beautiful building. I think that the walk to the entrance was even more spectacular than the interior, with such beautiful architecture surrounding me from all sides. A little while later I came out again, and instead of taking the transfer train down, I decided to cross the park and walk to the exit myself. It was still grey (but dry) and only March, so the flowers were not out yet. However, I can imagine the beauty of Parque de Pena during spring time. After another stunning ride through the green hills of the National Park, I arrived at my third stop: Parque de Monserrate. The weather finally decided to be on my side as all the clouds suddenly disappeared and the early Spring sunshine warmed my skin. 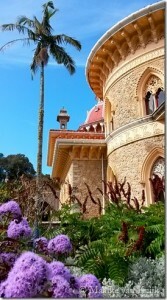 Palace de Monserrate lies in the middle of the park which was designed by Sir Francis Cook. The Englishman hired the head gardener of Kew Gardens to do the landscaping. The park features hundreds of exotic plants from all of the continents and is still considered as one of Europe’s best stocked gardens. You can imagine the joy I felt while walking to the palace and seeing all of these different species of flowers and plants. The palace itself was inspired by the Brighton pavilion, and the resemblance was visible right away. 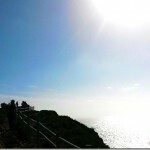 While time was running out on me, the sightseeing bus dropped us off at Cabo da Roca. 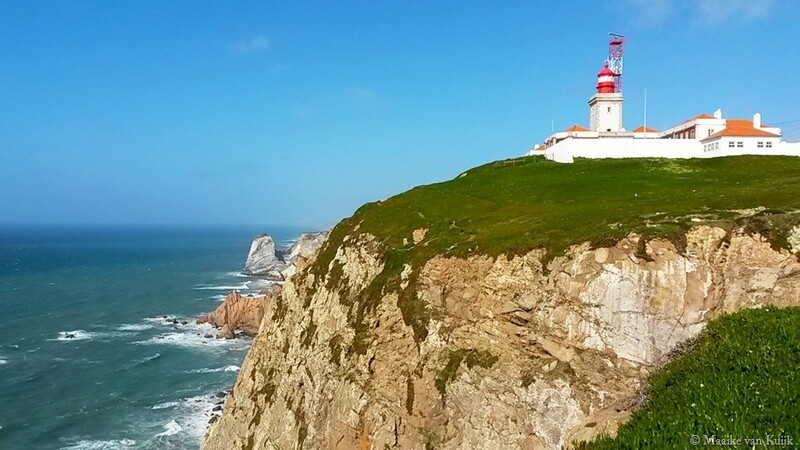 This is the cape that forms the westernmost extent of mainland Portugal and continental Europe. The scenery was breathtaking. I watched sea waves bashing in against the rocks, a lighthouse standing proudly on top of the cliff, and a tall memorial stone overlooking the Atlantic Ocean. 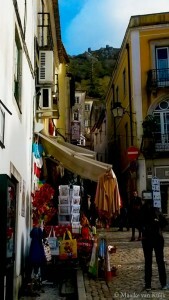 We had about 20 minutes before the bus would take us back to Sintra-Vila. So, during that time I took as many pictures as possible. 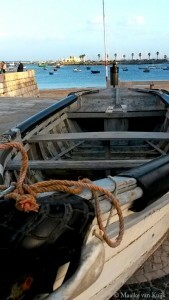 It now really was time to return to Lisbon, but not without stopping first for dinner at the coastal town of Cascais. While on the train, I let my mind go over all of the beautiful sights I had seen today. 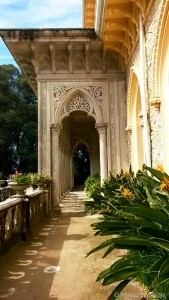 I really had no idea that there was so much natural and architectural splendor, so close to Lisbon. 8 Hours definitely wasn’t enough to see everything I wanted. There’s only one solution to that: I’ve to go back one day!